DO NOT be fooled by some Compact Inline UVs sold on the internet with medium pressure UV lamps (which the MAJORITY now due with a resulting 75% reduction of UVC output), poor construction, and poor ballasts that often burn out after a few months. We admittedly sell models with the baffles due to customer demand, but our experiments show these do not improve UVC dwell time and over all sterilization and therefore we refuse to charge extra for the models with baffles/twists. As well do not be fooled by similar models sold on Amazon or Ebay that are cheaper versions of these models. FACT: Our AAP models INCLUDE Low Pressure High Output UV Lamps that have 4 times the important UVC output as well as electronic ballasts capable of firing these High Output lamps (these lamps/ballasts add to the cost, thus the higher price of our units). Reference: Actual UV-C Emission from a UV Bulb; A MUST READ if you are thinking of purchasing one of these cheaper versions!!! For more in depth UV Sterilizer/Clarifier information please read!! Please note that Via Aqua initially changed their Terminator UVs, to which the newer design had more issues than the many previous year, however Via Aqua has failed of late at customer support while at the same time discontinued many of their products including the Terminator. We have since picked up this upgraded line SunSun line of UVs with High Output/low Pressure UV Lamps, from our extensive experience is 95% of the more reliable Terminator design & include a HO UV lamp, making these easily the best Compact UVs available for the price based on our 38+ years using and designing UVs. •	AS PER OUR TESTS; Excellent exposure time per gph of water inside unit with a flow design that maximizes water exposure. As well as a less than 1.5 cm distance between UV inside wall and quartz sleeve (approx .6 cm reaction chamber) with an Intensity Factor of at least 250. This ENSURES the AAP/SunSun Compact UV can provide at least LEVEL ONE UV Sterilization!! •	Quite simply there is NO better UV in its class, the "Compact Aquarium or Pond UV Sterilizer" (yes there are better units for more money in a different class such as TMC Advantage or Vectons). 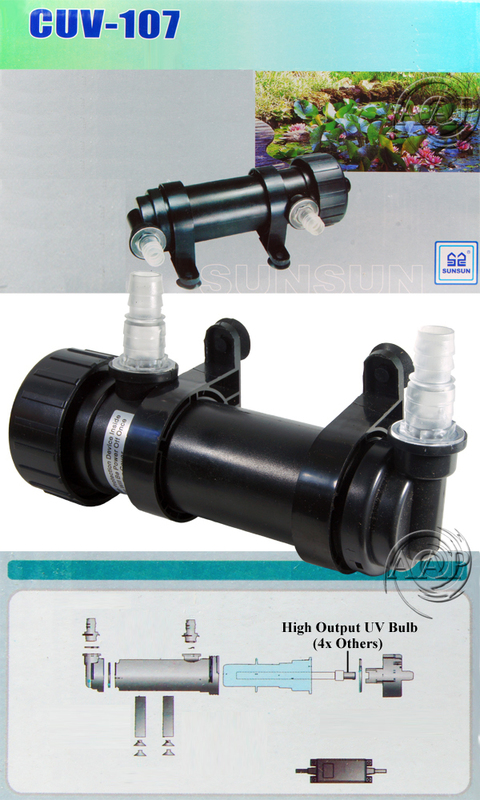 •	AAP SunSun (Previously Terminator) UV Clarifiers can be installed in-line, (such as with a Canister Filter or power head) placed on a valve controlled bypass, or hung on the back. 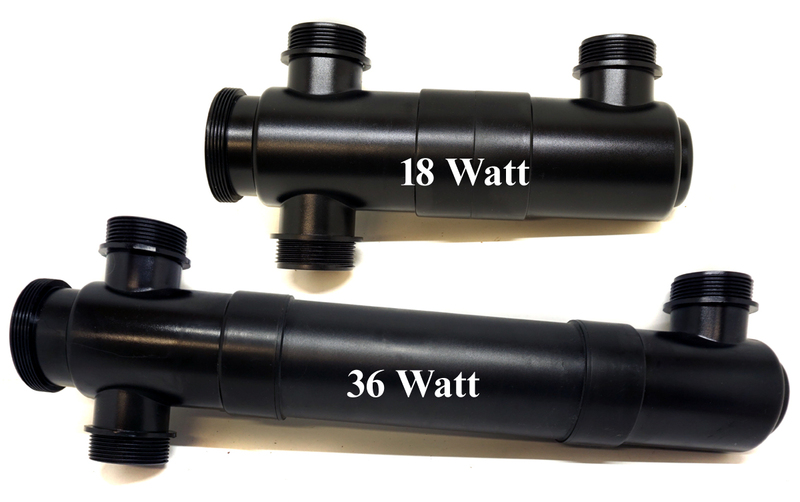 For HOB applications where an internal power head/pump/filter is used, I recommend the purchase of the intake and return adapters which are sold separately to keep tubing from "kinking" (see picture of these lower on this page). •	These Compact UV Sterilizers/Clarifiers use 3/4 inch to 1.50 inch ID (inside dimension) tubing, except for the 7 Watt SunSun/Terminator which uses ½ inch to ¾ inch vinyl tubing. We recommend a pump with at least 4 feet of head pressure to adequately "push" water through even a 5 Watt UV. These UVs are not designed to be "hard plumbed" directly to PVC, rather utilized with flexible tubing then to pump/filter or PVC. •	AAP/Terminator UV Sterilizers/ Clarifiers utilize premium standard low pressure mercury High Output UVC lamps are rated at 36,000 to 42,000 microwatt-seconds per square centimeter (uw-sec/cm2), which is the industry standard. Although be aware that many SunSun UVs using the same model utilize UV bulbs that are medium pressure which ONLY provide 7-14% UVC irradiation, which is 1/4 the output of the lamps we utilize (often sold for low prices at eBay & Amazon) . This is why SunSun on the box calls it a UV Clarifier, as when run under the flow rates suggested on the box, along with the medium pressure UV lamp that is standard on many models other than the AAP models, this would only be a UV Clarifier. Our flow rates suggested along with the low pressure HO lamps, makes our AAP/SunSun UV Sterilizers true level one units!! Also, many popular brands of UV Sterilizers such as Cal Pump or Tetra use proprietary UVC Lamps/bulbs, forcing the purchase of replacement UVC bulbs at often triple the price of industry standard bulbs. •	Although we give many pond/aquarium size suggestions, these can vary greatly based on bio load & more and in the case of ponds for instance, even a very small pond in full sun in a warm climate would likely be best with a minimum of a 9 Watt UV Sterilizer. •	Please note that while our suggested aquarium/pond sizes as well as recommended flow rates may seem lower than most other web sites UV Sterilizers/Clarifiers (& even what the manufacturer writes on the box), this is because we publish tested and proven flow rate and aquarium/pond size suggestions based on our 30 years experience, not best case scenario or even impossible flow rates. Know that when you purchase a UV Sterilizer from us whether the SunSun/Terminator, TMC or others that recommendations are based real world experience and facts. Also consider the TMC Vecton/Advantage Premium UVs such as the Vecton 8 watt, which due to their high UVC dwell time actually outperforms a 9 watt Terminator or the 15 Watt Vecton or Advantage which outperforms the 18 watt SunSun/Terminator. •	Dimensions: 10" x 3"
•	Unique Swivel directional intake/outlet at the end of the UV Sterilizer body; with this you can change the direction this inlet/outlet port faces for easier mating to specific aquarium or pond applications. •	Easy to view light port at the end of the UV Sterilizer body allows for user to see if the UV lamp/bulb is properly functioning. •	Dimensions: 11" x 3"
We have discontinued the 18 & 36 Watt Model models as market pressures from Amazon, Chewy, eBay, etc. made it impossible to sell these models at even a $1 profit after the upgrade in the High Output UV Lamp & ballast we made. These products are now among many that are a casualty of our industry's self destructive slide into expecting every thing at a discount or free. Before discontinuing, we fielded questions regularly from person here and in forums we are active in only to have the person purchase a lessor product from a discounter. As well, we still constantly get questions from those who purchased lessor products via these discounter now seeking help with their product. We suggest our True 'Category A' AAP/TMC line of UV Sterilizers, as these have still a much higher dwell time, and 2-3 times the longevity. Long term, these TMC UVs pay for themselves. 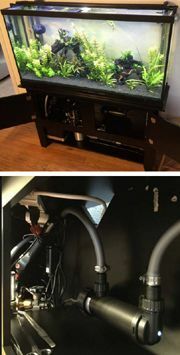 The picture to the left shows just one of many ways to connect these AAP Terminator Compact True UV Sterilizers to an aquarium when not run in-line on the return from a canister filter. Readers might note how we connect the parts for simplicity as well as for a snug fit that does not put too much strain on your UV Sterilizer. 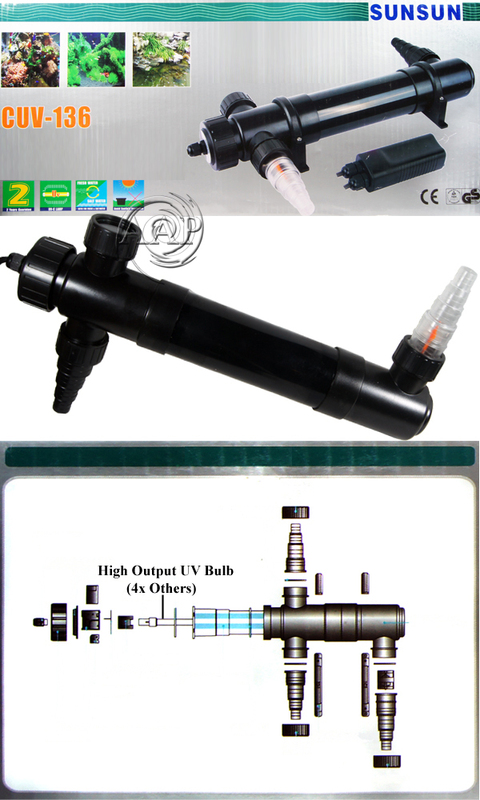 For use with Vecton, Terminator, or any other under aquarium UV Sterilizer. 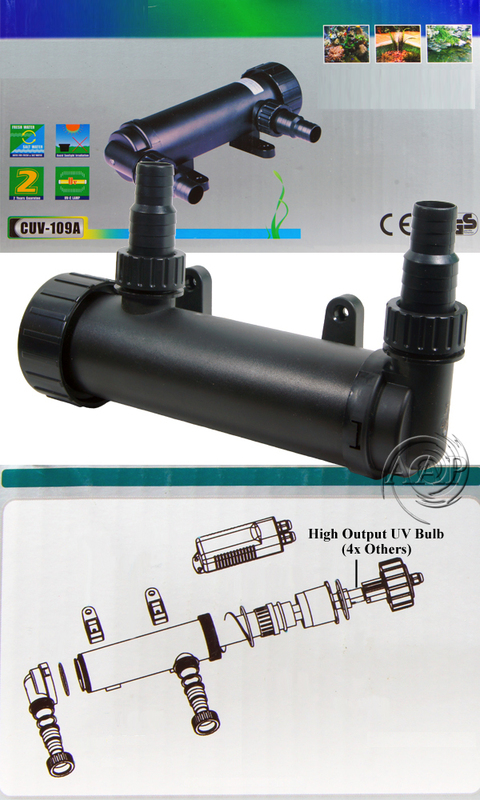 For use with in-tank power heads or internal filters to safely return or intake water to the aquarium without hose kinks. 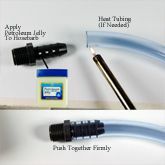 Useful for adapting 3/4" inch hose barbs on UVs (such as the 9 Watt Terminator) or other aquarium equipment to the 1/2 to 5/8" hoses common Ehiem and other filters. FOR EXAMPLE; to fit a 9 Watt Terminator to a Fluval 404 Filter, you would splice the out flow tubing and connect the 1/2 to 5/8 barb to the filter tubing on both sides and the 3/4" barb would attach to the Terminator (in the middle of the outflow).